Nāʻū or nānū (Gardenia brighamii) is one of several members of the Coffee family (Rubiaceae) native to Hawaii. 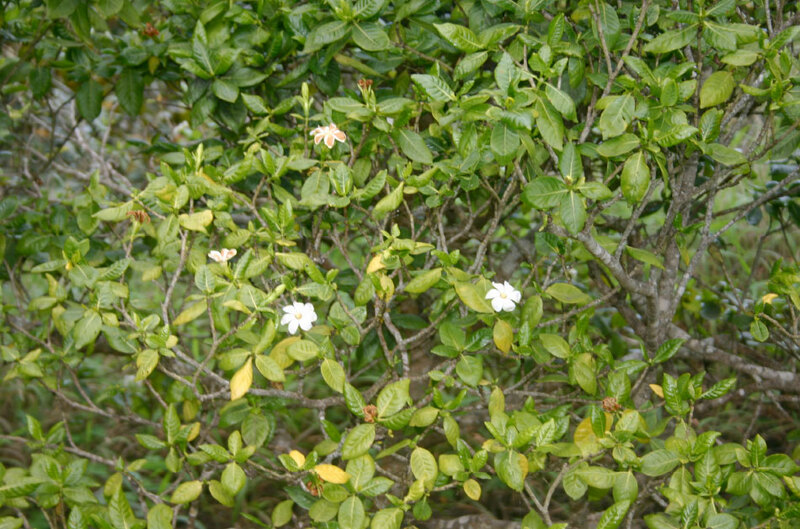 The featured species and the two other endemic gardenias, G. mannii of Oʻahu, and G. remyi from Kauaʻi, Molokaʻi, Maui and Hawaiʻi Island (Hilo and Puna districts), are all federally listed as endangered species or candidates for such. The generic name Gardenia is named in honor of Alexander Garden (1730-1791) of Charleston, South Carolina who was a botanist, zoologist and physician, and corresspondent to John Ellis, zoologist, and Carolus Linnaeus, who devised the classification of genus/species we presently used today. The specific epithet brighamii, is named in honor of William Tufts Brigham (1841-1926), geologist, botanist and the first direction of the Bernice P. Bishop Museum, Honolulu, Hawaiʻi. The beautiful fragrant flowers were strung into lei by early Hawaiians. Kapa anvils or kua kuku on which kapa was beaten in the second-stage process was made from the wood of nāʻū. The intense orange-yellow colored pulp of the fruit was also used to dye to kapa a rich yellow by early Hawaiians for the aliʻi. This vibrant color used for kapa was called nāʻū or nānū, after the plant itself. Today, dyes are still made from the fruit of nāʻū turn out to be a beautiful, bright golden yellow which does not fade when dried.